We would like to thank Edward Riojas for our guest post today. Edward is the liturgical artist who has been collaborating with Carrie Roberts to the create the Designs to mark the Celebration of the 500th Anniversary of the Reformation. Thank you, Edward, for sharing with us today! Somewhere along the line, beauty got ignored. For several reasons, the ornate beauty of the Old World was chucked overboard when Lutherans crossed the pond to America. First, there was the issue of cost. Debates over artwork became pointless when the church building needed a new roof. The pastor’s salary needed to be kept above the poverty line. Teachers needed to be paid for the expanding school system. This practical frugality was due, in part, to lingering sentiments of Pietism, in which the downplaying of artwork and ornamentation was embraced implicitly, if not openly. Visual expression of the Scriptures fell squarely in the category of adiaphora, so artwork was often among the first things to go. Fallout, however, extended beyond the fine arts and into our own time. Architecture of church buildings slowly leaned away from the sublime toward the cheap. Ornamentation was stripped wholesale in favor of 1970’s Mod Squad motifs, ethnocentric color schemes, and designs with nary a straight line. This peripheral piffle further discouraged embracing the arts on a serious level. Slowly, minds have begun realizing that, while parishioners‘ homes are decorated tastefully with abandon, the Lord’s house is more often allowed to remain bleak, bereft of meaning, and outright hideous. Thanks to a handful of confessional minds, beauty with roots in much earlier days is returning to Lutheran sanctuaries. Carrie Roberts’ Ecclesiastical Sewing enterprise combines the ingredients of fashion design, liturgical integrity, and historical sensitivity to produce beautiful sanctuary pieces that were once commonplace. The entrepreneur brought me on board to help with design, and we agree that confessional considerations are paramount. With each new set of designs, the bar is set astronomically high. 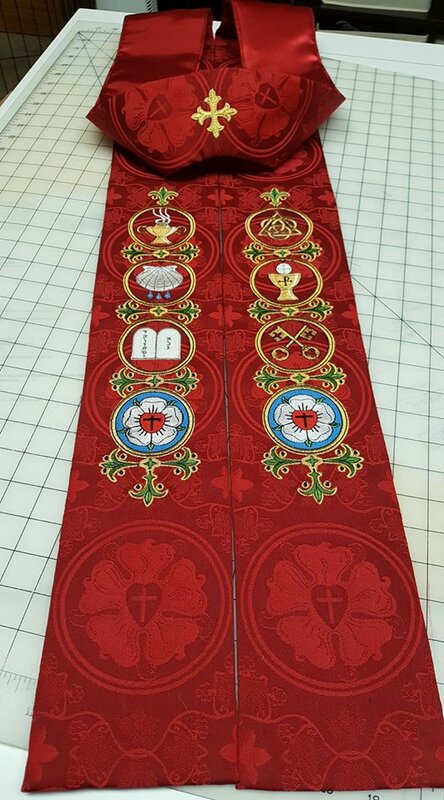 Ecclesiastical Sewing’s newest release of the “Stole Style #3 in the Luther Rose Brocade” is a good example. It is not simply gorgeous – it is confessional. The embroidery is not a random collection of pretty designs. In this case they are symbolic of the Six Chief Parts. The upper left contains a censor, symbolizing The Lord’s Prayer (”Let my prayer rise before You as incense…”). On the opposite side is a symbol for The Holy Trinity, indicating The Creed. Below The Lord’s Prayer and The Creed are symbols for Holy Baptism and The Lord’s Supper. The Baptismal scallop shell has three water drops, confessing Baptism into The Name of The Father and of The Son and of The Holy Spirit. The sacramental Chalice has a Chi-Rho monogram, confessing that “This IS My body and this IS My blood.” Below the Sacraments are the tablets of The Ten Commandments, and a symbol for The Office of the Keys. Each key has a conspicuous cross and trefoil. Below these symbols are a pair of Luther’s Rose, which contain rich, confessional symbolism of their own – central to each being the cross of Christ. The underlying brocade also bears Luther’s Rose, and is interwoven with crosses and grapevines. A traditional cross embroidery at the back of the neck is the last thing the pastor sees when donning the stole. And, of course, the stole itself is a symbol of the yoke of Christ as the pastor acts in His stead. This particular stole will be worn today, May 19, during Commencement Day services at Concordia Theological Seminary in Fort Wayne, Ind. And, yes, it is a beautiful thing. Digitized designs can be downloaded from the site for the client to stitch out. Finished stoles may be ordered on the website in green and red. There is a lead time of 4-6 weeks. Upon request, The Six Chief Parts stole can also be stitched on other fabric colors for other seasons of the church year. The embroidery itself can be ordered, then stitched by the client to their own stole. Stay tuned to Ecclesiastical Sewing as other elements of this set are put into production and posted on its site.